Most skin diseases occur in people of all nationalities, regardless of their skin color. Particular problems encountered in the skin are more common in people with different hues of skin, and sometimes a disorder seems more prominent because it affects skin color. This column and the two that follow will consider these problems and their treatments. Skin color is determined by cells called melanocytes. Melanocytes are specialized cells within the skin that produce a pigment known as melanin. Melanin is produced and stored within special structures known as melanosomes, contained in the melanocytes. The melanocytes make up only a small percentage of overall skin cells. In fact, only two to three percent of all skin cells are melanocytes. The variation in skin color we see across all people is determined by the type and amount of melanin produced by the melanocytes. All people inherently have the same number of melanocytes. A recent theory indicates that the differences in skin color are really a reflection of the skin’s ability to protect against ultraviolet radiation. Persons living closer to the equator produce more melanin because the ultraviolet radiation is more intense and ultraviolet protection is required by the human body. 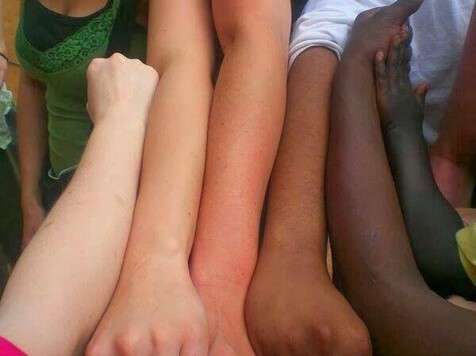 Groups of people living further away from the equator produce less melanin, resulting in lighter skin color. One reason treating pigmented skin can be somewhat tricky is that traditional textbooks have had only black and white photographs. Additionally, many lesions have been described as red, pink, salmon, or fawn-colored. This certainly is true in Caucasian skin; indeed, many of the textbooks that were written had this as the majority patient type. However, in tan, brown, or dark-brown skin, inflammation can look grey, copper, or violaceous in color. Additionally, certain conditions will have a slightly different presentation in pigmented skin. It is very common for a child of color to have a very light area of post-inflammatory hypopigmentation. This is where the inflammation of diaper irritation causes the melanocytes to stop producing color, leaving light or white patches. With the appropriate treatment, the color almost always returns to normal within a few weeks. In older patients, inflammation can lead to post-inflammatory hyperpigmentation. This is most commonly seen in areas where acne blemishes heal, leaving a dark spot behind. These, too, will fade with time; however, it can be quite persistent. Vitiligo is a skin condition that occurs in all people, but it is most noticeable in patients with tan, brown, or dark-brown skin. I believe that vitiligo is really the end stage of several different disorders. In some disorders, the melanocytes are attacked by the immune system, and they die. In other conditions, the melanocytes are pre-programmed to die early. 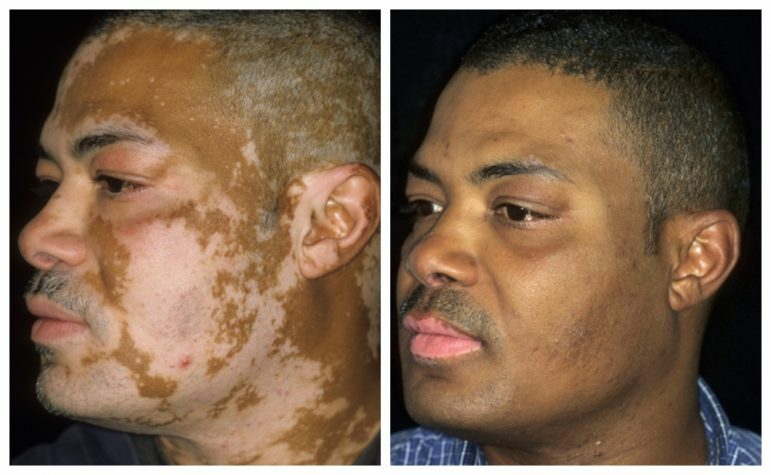 No matter what the cause, ultimately, patches of vitiligo are white spots devoid of melanin. Because these areas lack natural protection, vitiliginous patients must wear sunscreens to prevent ultraviolet radiation exposure and subsequent cancer later in life. In the majority of cases, vitiligo is probably the result of an auto-immune or inflammatory attack on melanocytes. In these cases, topical anti-inflammatories and phototherapy, most notably narrow-band ultraviolet B, tend to be most effective. 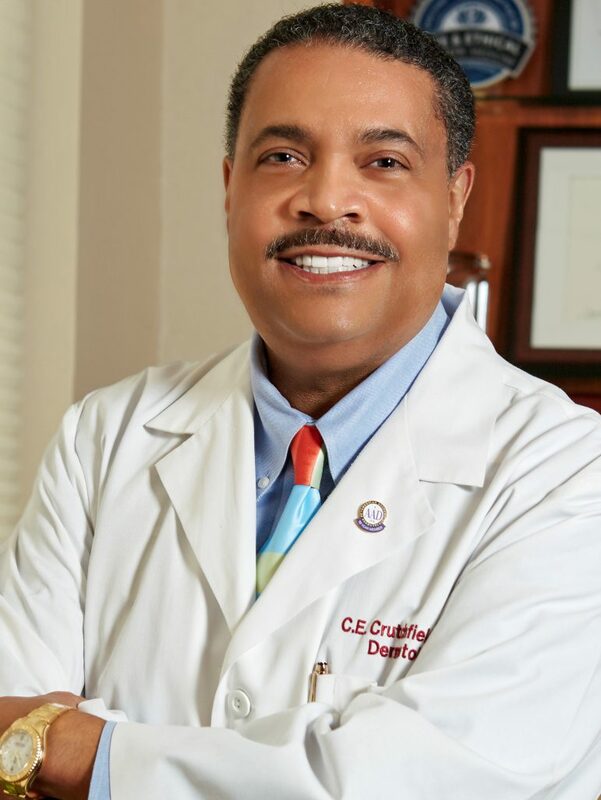 We have a success rate of approximately 75 percent in our clinic. In the remaining cases, these are probably related to a genetic program in the melanocytes where they die prematurely. Usually, with the appropriate treatment, signs of vitiligo can be reversed in one to two months. Pityriasis alba is a condition where white patches occur on the arms, trunk and, most notably, on the face. This is a widespread condition seen primarily in adolescent patients of color. It is a result of very mild irritation and/or eczema leading to post-inflammatory hypopigmentation where the melanocytes temporarily stop producing color. Gentle topical anti-inflammatory lotions, mild cleansing bars, and ultra- moisturizing lotions can be used to treat pityriasis alba. The loss of color in this condition is usually only temporary and is most notably seen on the cheeks of adolescents. It tends to occur slightly more frequently in women than in men. These are tan to brown to black, raised papules that can occur on the forehead, cheeks, and neck. Under the microscope, they resemble other benign growths known as seborrheic keratoses. We use a unique surgical technique in our clinic that can achieve excellent results in treating dermatosis papulosa nigra. Indications for treatment can be pain, itching, irritation, and cosmetic reasons.